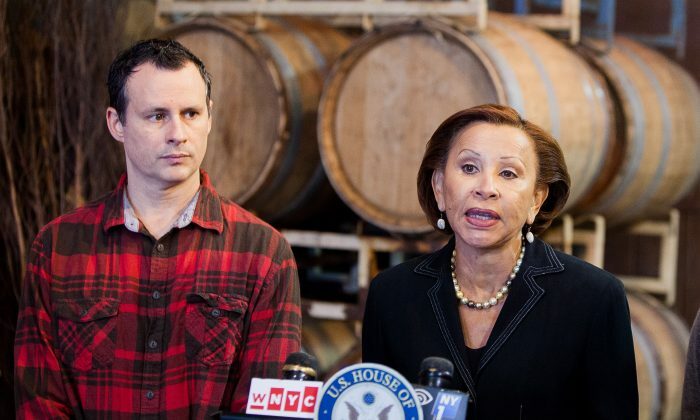 NEW YORK—Mark Snyder, owner of the Red Hook Winery, acted with peak efficiency on Oct. 30, 2012, a day after Hurricane Sandy devastated his business. At 5 a.m. he arrived at the scene to survey the damage. At 11 a.m. he submitted an online application for a disaster loan from the federal Small Business Administration (SBA). He submitted all the required documents, but was later asked for them again. He resubmitted, and was asked for them again. Over the next eight months he handed over his tax forms at least ten times. He was handled by at least five case managers. And he accumulated a pile of documents at least five inches thick. In the end, he gave up and withdrew his application. “The amount of hours that I spent trying to manage this loan made my recovery less effective,” Snyder said at a Thursday press conference at his winery, which has been finely restored thanks to a small grant and a loan from the city, and a lot of community help. Over 5,000 New York City businesses followed Snyder’s footsteps. Less than one quarter received the help they needed from SBA, according to a September report on the matter by the federal Government Accountability Office (GAO). “This agency (SBA) was overwhelmed and unprepared for Sandy,” said New York Congresswoman Nydia Velázquez, who asked GAO in May to investigate SBA’s Sandy response. The fact is, SBA should have been prepared. After Hurricane Katrina caused damage of over $100 billion in 2005, Congress passed a bill allowing SBA to speed up the process by using private lenders to issue loans of up to $2 million, including bridge loans of up to $25,000 that could have been approved within 36 hours of applying. But these loan programs existed only on paper. SBA never put them in place, GAO reported. SBA officials told GAO that private lenders weren’t satisfied with the loan programs rules. But SBA never asked Congress to change the rules. She acknowledged though, that the House Committee on Small Business, which she is a member of, lacked on oversight. “Maybe if we spent less time conducting hearings regarding regulations or Obamacare but instead doing the proper oversight to make sure that laws that we passed are being implemented,” she said, things would be different. Ultimately, of some 15,000 Sandy-affected businesses that asked SBA for a loan, over 10 percent eventually withdrew their applications. Of those that remained, almost two-thirds never got the loans. Most were denied due to a lack of repayment ability, poor credit, or missing paperwork. The rest had to wait an average of 3 months to get the money. In a response to GAO, SBA stated it didn’t anticipate how fast, or how many people would apply for loans online. While also handling tens of thousands of loan applications from private homeowners, applications from businesses may have been delayed. In addition, the agency lacked manpower and faced computer system lags and crashes. Velázquez said she would push for the SBA loan program to reopen to Sandy-affected businesses still struggling, even almost two years after the disaster. That would, however, require a legislative action by Congress, possibly in January, after the midterms elections reshuffle the House and a third of the Senate.